BC Buzz Honey the perfect local food success story, two buddies getting together and offering a variety of locally produced honey to nearby residents. Sweet. I was especially pleased to see they have both my favourite kinds in stock, creamed and dark, as well as some interesting mint honey which I’m tempted to try. I don’t eat a lot of creamed honey, because it’s pasteurized and all, which kind of defeats the goal of guilt-free sugar indulgence on the basis that it’s raw and therefore complete with all it’s wonderful medicinal properties. Can’t beat it on warm, buttery toast, though. Mmmmm. My other sweet encounter was at the Langley Farmers Market where I learned something new about honey and bees from a fellow who knows a thing or two. Fred Hanefeld has been keeping bees and collecting honey on the same property since the early 1960’s, which I’d like to point out, is before I was born. What I learned when I took a moment to strike up a conversation made me glad I had. In all the years they’ve owned the property Fred and his wife have never used any kind of chemicals on it. The previous owner also didn’t use herbicides and the owner who had the property before that used it for feeding his dairy cows in what would have been mid-1950’s at the latest, before widespread spraying became popular. How’s that for organic?! In my books, nothing beats this kind of small scale, truly local food production with history, in-depth knowledge, and commitment to quality going back half a century. Wow. Fred is a man after my own heart, abiding by the philosophy that doing things nature’s way is by and large the more effective option. When I asked him about the health of his bees–you know, because it crops up in the news cycle every once in a while–he told me a fantastic story about a number of colonies he bought years ago who all turned out to be sick. Over the winter he fed them honey (which has many medicinal benefits, as you know) instead of the sugar water that commercial producers feed (sugar is more cost-effective, after all). And, after feeding those sick bees genuine organic honey, they were all in fine form come spring and he’s never had an issue since. That story gives me a sense of hope about our current bee crisis. 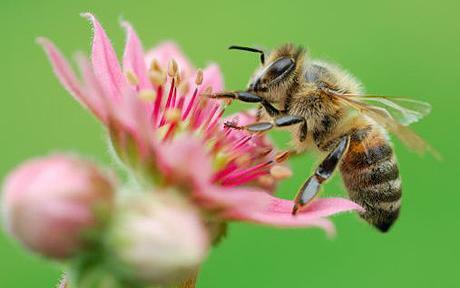 That if we feed them quality, medicinal honey which heals them from the inside out as nature intended and allow them to live on quality, unpolluted land, they can develop the immunity they need to survive, offering us a possibility to counter the doomsday predictions of no bees, no food. I like that ending better. The other tidbit Fred offered from his wealth of knowledge is something I’d never considered: what makes honey different colours. I suppose I thought it had something to do with processing if I’d ever given it a moments thought, but Fred told me the colour changes according to the source of pollen the bees collect. Some honey can be almost clear, but my favourite, the dark the better, comes from wild flowers. Sweet. Hi Liz, only bee`s can make honey, buckwheat honey is the darkest. came around once a year.Love that honey store.Buy local. Cool, how long did you keep bees? 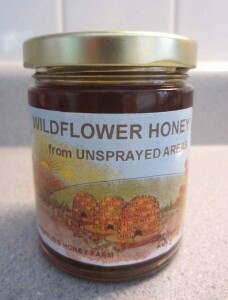 Fred says the lightest honey, almost clear, is from fireweed flowers. I’d like to try that next to some buckwheat honey. Yum! Thanks for stopping by our Honey Hut! It’s great when people recognize the hidden treasures in our communities. There is actually a little but of misinformation as the creamed clover honey is not actually pasteurized it is actually crystallized honey which is a natural process. Pasteurization is a process where adding heat to the honey to destroy “undesirable” crystals in the honey to make it clear for the supermarket shelves. We actually have some raw honey that is crystallized or creamed which has never had heat added to it (some honey is known to crystalize in the comb depending on the nectar source!). Thanks so much for the updated information. I’d love to stop by one day to say hello. Couldn’t bite my tongue on this. Those first two honeys are hardly local. 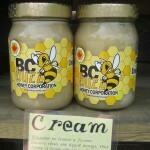 although the Creamed says it is a BC Product, Which isn’t a bad thing. 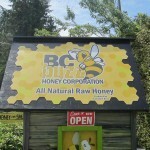 a good BC Clover honey is probably your safest bet if you seek an “organic” quality honey. The Mint Blossom even says Eastern Wahington right in the description. 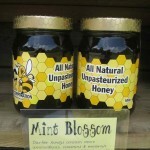 Since BC beekeepers can’t run bees over the border this would mean it was likely imported by the seller. And the the honey produced in “Spray Free areas”?! 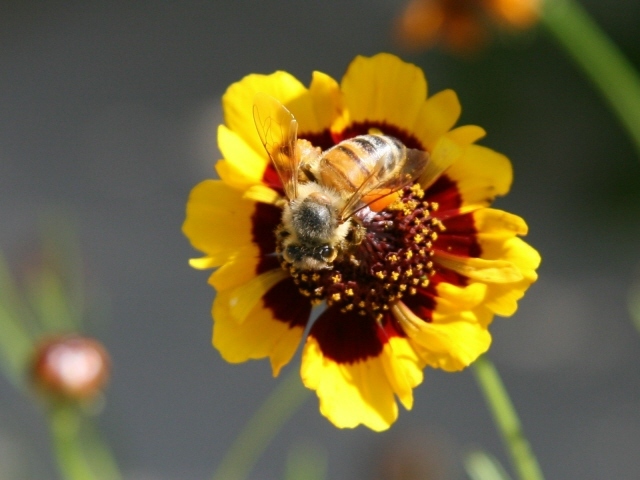 Fred is listed on the BCHPA website as a crop pollinator. In Abbotsford because of monoculture not much isn’t sprayed. Fred made media headlines in 2012 for having 55 of his bee hives stolen in a blueberry field in a heavily sprayed area south of YXX. A terrible loss and good to see he was able to carry on. Sorry, but I was disappointed by what came together for me as I read this article and then researched the producers. 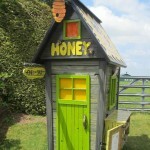 There are great honeys produced locally. Some of the best in the province. I hope you find them. I always recommend getting to know your producers so I never turn down an additional perspective. As for the Eastern Washington not being local, I still consider it more local than anything that comes from farther afield, regardless of the border.